One of the most popular dishes in the philippines, the native lechon is a must in every filipino occassions,whether it is a birthday,Fiesta or just a family reunion. 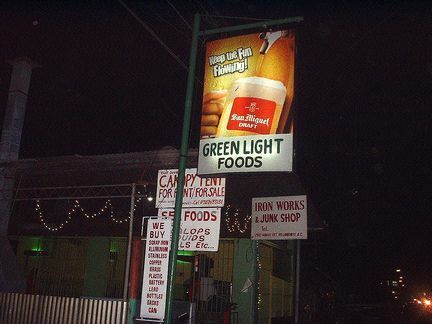 You can see in the picture that it has been in the business ever since. 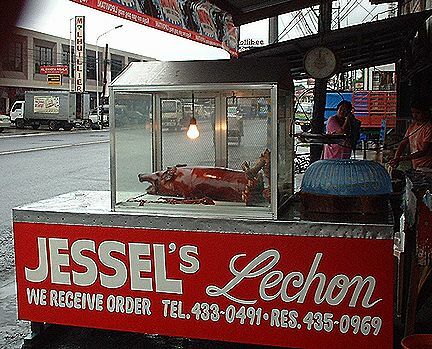 The price of selling lechon is by kilo whether it is bought,1/4,1/2 or per kilo. It comes with a sauce that is compatible to the variety of lechon such as lechon kawali,lechon manok and the most best is the native lechon. 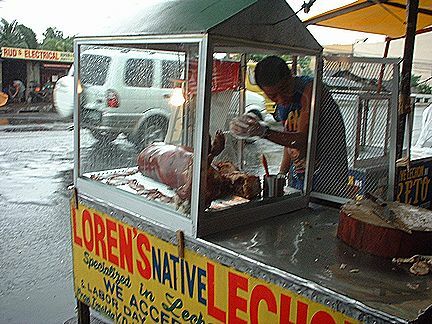 Once you have tasted the crispy skin of lechon,you just can’t stop but ask for more…try it and believe! Have a pleasant day! Hello blog viewers! Good evening to all of you! I hope all of you are doing fine. This is a picture that portraits the Asia’s Best Beer…The San Miguel Beer. This is one of the proudly made Philippine product. A lot of variety has comeout that is related to San Miguel products, there is San Miguel Light, Red Horse Beer, San Miguel Barrelled. It is also one of the economic helpers of the country. During occassions it is impossible that you cannot find any San Miguel products. It is one of the life of the party, most of all it nourishes the true Filipino friendship…”Taas Mo ‘To” which means a tossed for the friendship. A pleasant day to all!!! Hello blog viewers! Good evening to all of you! I hope all of you are doing fine. By the way, today the school is having a celebration of fruit festival. 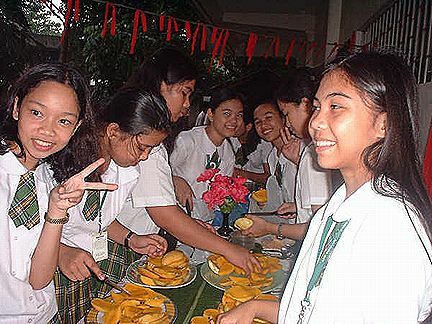 Everyone enjoys preparing ripe mango on the table. Do you know the National Fruit of the Philippine? If you don’t, well I want you to know that mango is our National fruit. Here in Negros, a vast of land is planted with mango, ripe and unripe mango likewise called also as green mango and yellow mango. And above all, there are different kinds of mango, such as apple mango, carabao mango and etc. Do you seen a carabao mango already?? ?If we say carabao mango does it mean that it is same as with the carabao animal?Just kidding, of course not. It is only named like that because its size is bigger compare with other mango. By the way, I love eating of it. Look at their face, they are happy and expecting to eat as soon as possible as many as they can. Do you want to join with them? Have fun while eating the juicy mango!! !